Accessed by a short raft ride, Pirate's Lair on Tom Sawyer Island is essentially a large playground. Most of the island has been rethemed for the Pirates of the Caribbean movies but some old Tom Sawyer touches still remain. Interactive elements touch as a tree house, a rock playground, and a treasure cave, abound on the island. Be aware that it closes early as the island is also the major performance stage for Fantasmic! Location: The island in the middle of Rivers of America, rafts are boarded on the far side of Frontierland near Caf� Orleans. Date Opened: June 16, 1956 and significantly redesigned in 2007. # of Ride Units: None, though at most two rafts are in simultaneous use. Ride Capacity: No specific limit for the island, rafts can hold approximately 55 people. Open/Close: The island generally doesn't open until an hour or two after the rest of the park and closes around dusk; a sign giving the exact last time is posted near the raft loading platform. The island is also closed in inclement weather. Wait Times: It is rare to have to wait for more than one raft in order to get to and from the island. Once on the island everything is self-guided and rarely so crowded that you'd have to wait for anything. Length of Ride: Self-guided, but at least 10 minutes if you go over to the island and immediately return (a bit longer if only one raft is being used). Queue Description: None, just a little dock on the edge of the river. Health Restriction: Should be none, though some portions of the island should be avoided for some people (the caves if claustrophobic, the suspension bridge of prone to vertigo. Ride Access: The rafts to and from the island are wheelchair accessible (though new rafts being designed will require a ramp to get onto them). Most of the trails on the island are accessible as well, though uneven and surfaced with dirt. Most of the activities on the island (tree houses, caves, etc.) are not accessible and would require leaving a chair. Wheelchair Transfer: Not required, though necessary to experience some areas of the island and activates (such as caves and tree houses). Guest would be required to walk on their own through these areas. Audio: Sound does not play a significant role in this attraction. Weight and Size Issues: In general this won't be an issue though some of the areas of the island are more meant for children and have tight fits for large or tall guests. Other Issues: Some areas of the island (particularly the caves) make it difficult to keep an eye on children. Accidents are possible just about anywhere on the island if children are playing in an unsafe way. There is also nothing preventing falls into the Rivers of America and children should be watched as they would near any other body of water. At this location: The island has been in the middle of Rivers of America since the park opened even though it was not opened to the public until 1956. This Attraction's history: Various changes over the years have been made to the island as various show elements have been added and removed. 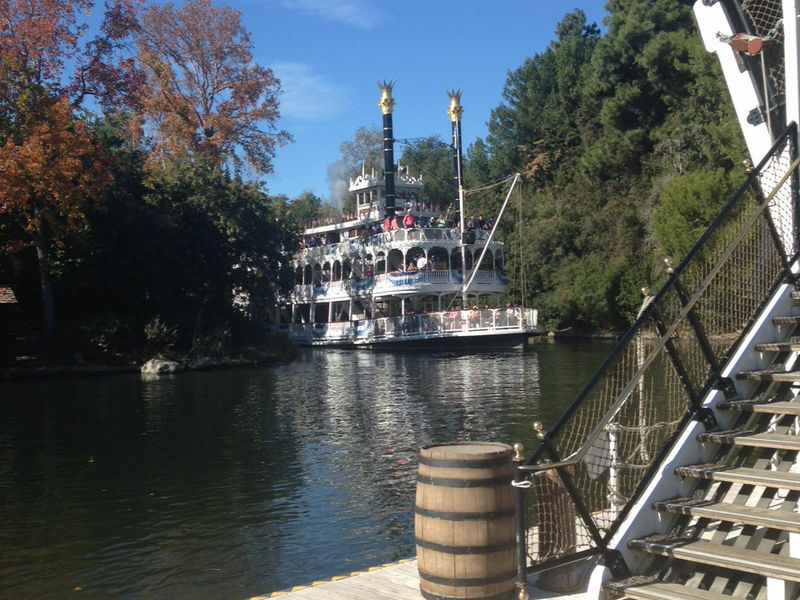 The raft docks have also moved several times in response to various changes along the Frontierland waterfront. Prior to the change from being simply Tom Sawyer Island to being Pirate's Lair on Tom Sawyer Island the biggest change had been the closure and eventual removal of Fort Wilderness. Fort Wilderness has been rebuilt to a degree but is not open to the public but instead houses performers and their equipment. When the Pirate's of the Caribbean movies proved extremely popular the decision was made to makeover the island to take advantage. Harper's Mill was turned into Pirate Point and a stage for performers. Injun Joe's cave became Dead Man's Grotto and in addition to pirate treasure gained modern lighting effects. Tom Sawyer's tree house, however, remains to remind guests of what the island once was. Yippies! : On August 6, 1970, the the West Coast Yippies conspired to take over Tom Sawyer Island for a "smoke-in" in protest of nuclear weapons (August 6 is the anniversary of the atomic bomb dropped on Hiroshima, Japan). Leaflets distributed beforehand indicated that they would attempt to take over all of Disneyland, but only the Tom Sawyer Island part actually happened. After spending some time on the island they tried to march down Main Street. Anaheim police had prepared for as many as 20,000 Yippies showing up and were waiting backstage in riot gear. During the Yippie march down Main Street things got unruly (and one of Disneyland's security officers was injured). At that point the police came on stage and attempted to evict the Yippies, who instead disbursed throughout the park. At this point the park was closed and emptied. The rafts: The three rafts currently in use are named Becky Thatcher, Injun Joe, and Tom Sawyer.